Dueck Defense designed the RBU as a simple no gunsmithing sight base to eliminate lost dots when aiming. Just align the fixed iron sights and your red dot is visible. The RBU is CNC Machined and then nitride coated. It uses factory sight dovetail and requires no modifications to your pistol and is perfect height to clear suppressors. 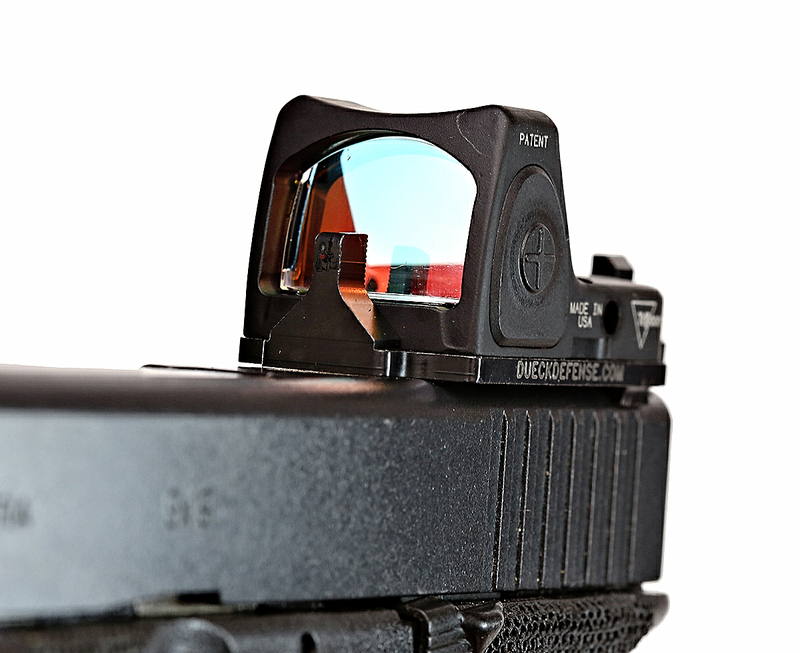 The RBU integrates the RMR to an iron sight platform which provides OEM-like retention and result. 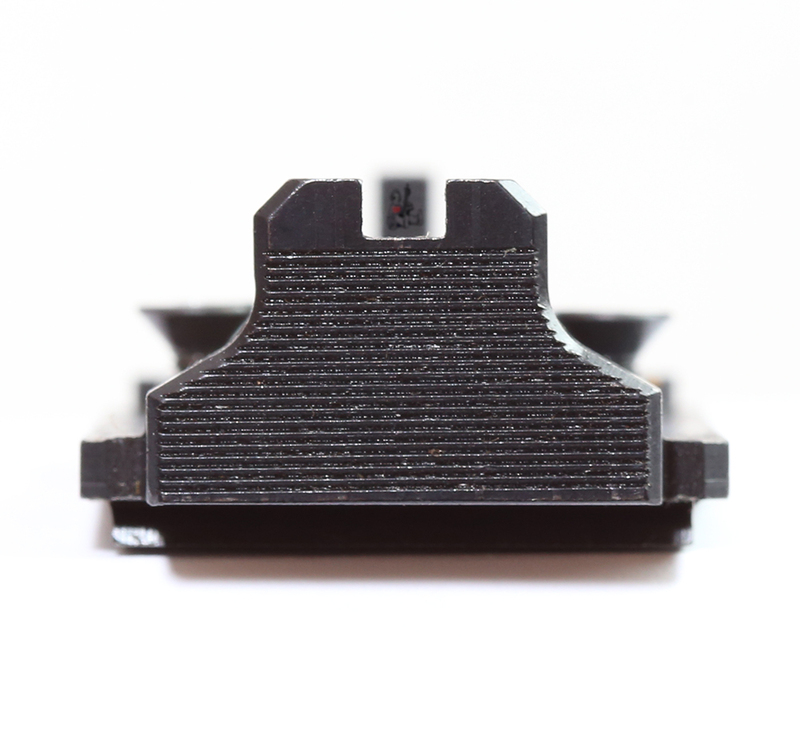 I contacted Dueck Defense in hopes of getting one of their RBU mounts because while I did want to run an RMR on one of my Glocks, I did not want to go through the journey of getting a slide milled for it, again. Luckily, they were nice enough to send me one of their RBU's for such purpose. I received this RBU on 10/15 and since then have had it on three different Glocks in various configurations and carry methods. 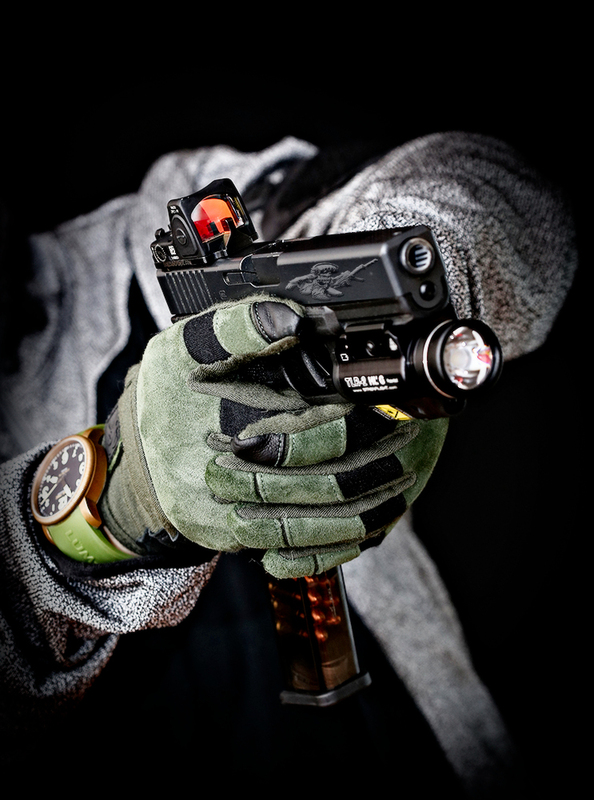 The RBU accepts any Trijicon RMR . It retails for $129.95 which is on part with any milling service you can purchase from most trusted shops. That does not include suppressor height sights and possible cerakote which may be thrown in with the milling. Out of the box the RBU appears to be very sturdy and obvious precision machined. It comes with two specific screws for the RMR, not supposed to use the provided screws which the RMR comes with when installing into the RBU. The RBU comes with two set screws as well. Once the RBU is pushed in place and zeroed properly, the set screws can be secured in place with loctite and then an RMR may be installed. 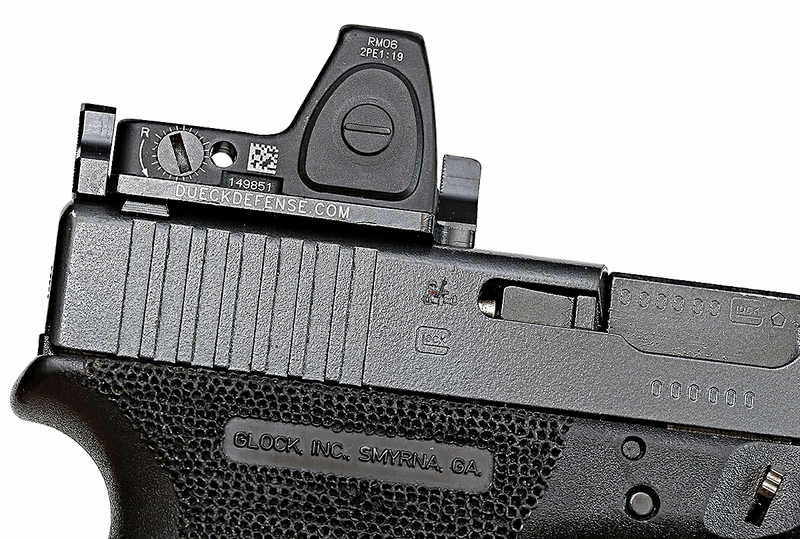 The front sight front is serrated against the plain back rear sight post, which has serrations under the rear sight arms. I zeroed the RBU sights at 7 yards and then proceeded to zero the RM06 3.25MOA LED RMR at 25 yards. Once I did that I ran a cold 100 drill, usually in the area of 10 rounds 10 seconds, as speed and accuracy are both illusive standards but that is where something like an RMR'd Glock shine. The above target showed I had to bump the RMR a bit, which I did. I was fortunate in that I got to employ the RBU in a variety of various training platforms. Every time I went to the range, which was fairly frequent for the 2016 year, I brought it out and ran a few drills with it. One several occasions I had access to varying distance targets, 5-7 to 20-50 to 100-150 yards, all at the same time. The RBU worked really well with this and allowed me to properly apply accuracy at speed as I needed to. The RBU really did do what it was supposed to do. I put in the area of 2500 rounds through my G19L before I removed this particular RBU and moved it to my V1.0 #voodoospecial. On which I shot a few hundred rounds and was very impressed with the RBU's overall ability to maintain zero both for the RBU as well as the RMR. As you can see at times after I reload I am search for the dot inside the RMR. I will say that this is a training deficiency and not any issue with the RBU. I ended up fishing for the dot when I should I have defaulted to the iron sights. 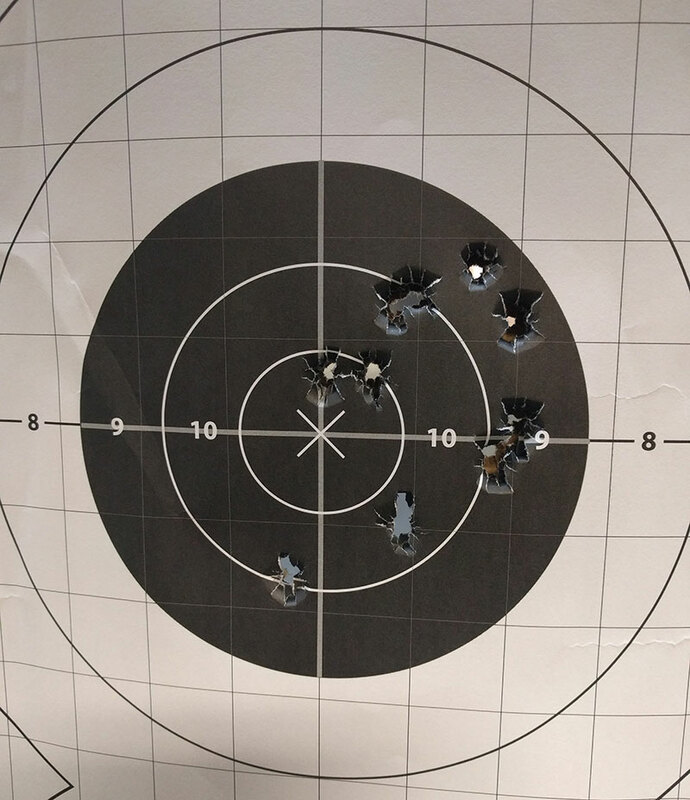 The short radius of the RBU's iron sights may have worked in my advantage but I did not utilize them properly, which is something I have changed in the way I train with an RBU equipped pistol. There are three questions I frequently get about the RBU from almost everyone who sees it. First, will it hold zero? 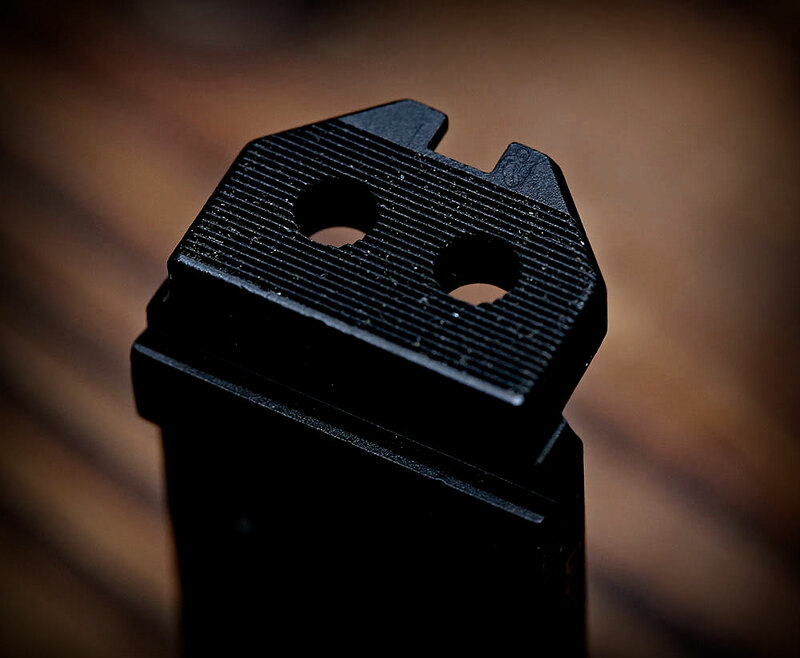 The tolerances on the RBU are pretty close to most OEM iron rear iron sights and the RBU requires a rear sight tool to install, or using a plastic/brass punch to move it into place. Once in place you have to tighten two set screws as well. With that said, I have yet to move it during training or otherwise shift the zero from use. Second, what about the short sight radius, will that not be an issue? If you know anything about sight radius you will know that the deflection over distance is greater when the distance is increased, which means that the longer the sight radius the more noticeable the movement in the front to rear sight relationship. This also means accuracy is affected, in both directions, it can be more accurate or less accurate. Now consider what the reason for using the RBU is in the first place, to install an RMR on your Glock pistol. Which you probably should zero at around 25 yards as shorter than that may be pointless since your iron sights may be able to do that work for you. Past 10 yards you can use your RMR's dot fairly well once you understand the hold over and continue to use it out to as far as you can see the target. The iron sights, however, are probably viable out to about 15, maybe 20 yards, but they shine at the 7 and in yard range. Third, but sort of an offshoot of the first question, will it bend/break? The RBU is not a light piece of tin. It is very sturdy and surprisingly heavy for its size. While I do not know the exact metal composition of the RBU, I am willing to be you will have to put it in a vice and hit it a bunch of times in order to get it bend. 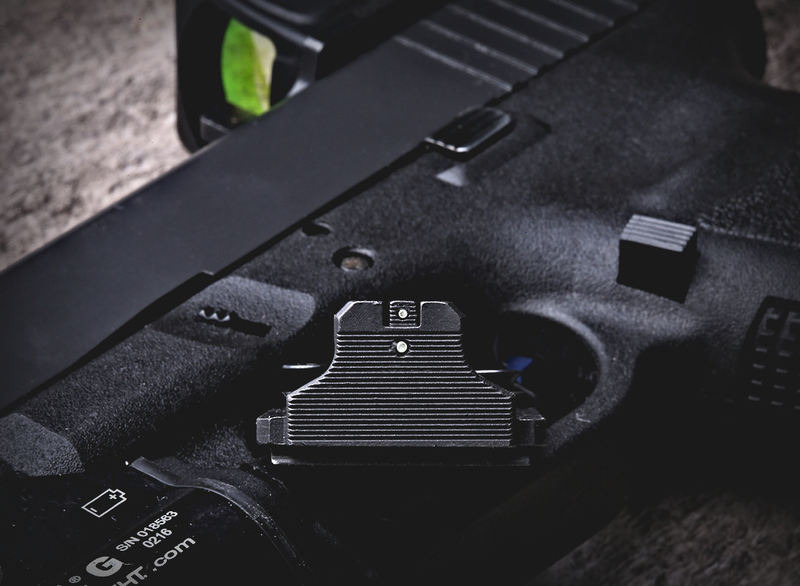 The RBU offers something that not only saves you money but can be installed onto most Glock dovetails without much hassle. Zeroing takes a few minutes and RMR install is easy. It allows those of us who do not want to mill our Glocks the ability to add an RMR and keep iron sights for half the cost of the typical mill/suppressor height sight combo. There are a few other options which I want to point out to compare and contrast against the RBU and my reasoning for picking it over them. 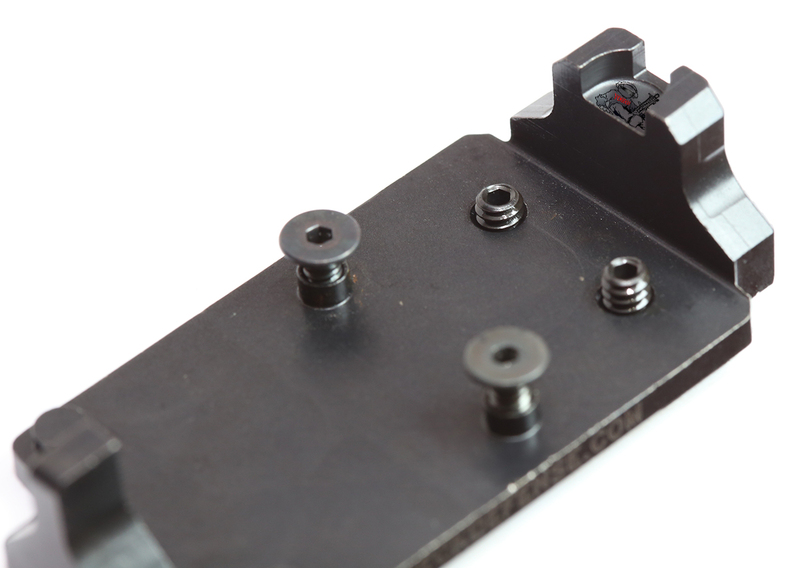 There is the RM44 Pistol Mount Plate which is about $67 and does not allow you to install any rear sight. JP Enterprises, and a few others make similar mounts. This is fine if you want to only run an RMR without any backup iron sights, but two is one, after all. Saurez makes an "L-Mount" which is like the RBU except it has one set screw instead of two for the dove tail and it has an additional point of contact at the rear slide cover plate. Three issues right off the bat which would be a complete deal breaker for me is that the front and rear iron sights can be removed, meaning that you have five possible points of zero loss for the "L-Mount" - the dovetail, the rear plate, the front sight, the rear sight and the rmr itself. Any one of those is loose even remotely the whole thing is out of wack. The RBU? Two points at all times - dovetail and RMR. As I stated before there is always the option of getting your slide milled by a trusted sources like L&M, DP Custom Works or the dozens of others who are known for doing good solid slide milling. The issues you will run into with this option is that you will have to deal with possible tolerance issues as not every single RMR is the same exact size and not every single milling specification will cut the slide to accept every variation. It also requires you to buy suppressor height sights. That already puts you more than $100 or so over the price of the RBU. 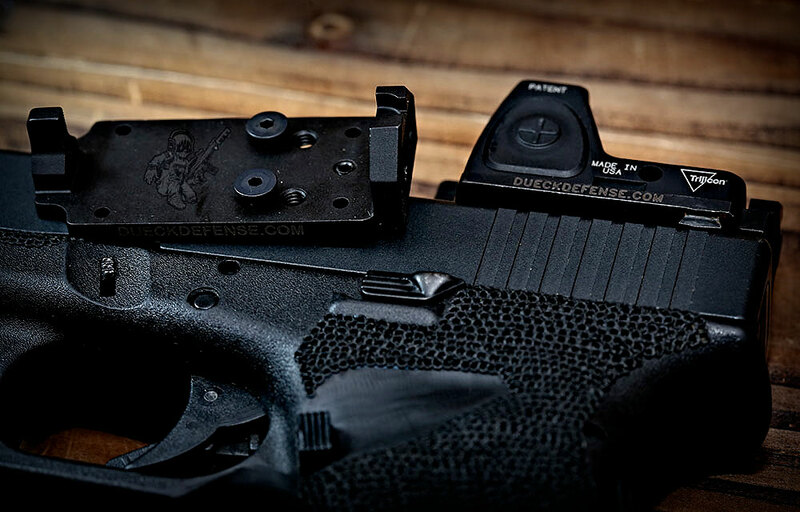 Buying a pre-milled aftermarket slide or an MOS slide is always an option. Reputable aftermarket companies (like ZevTech , ATEi, etc) can provide a pretty good setup right out of the box, some even come with all black suppressor height sights pre-installed, but those slides are not cheap and usually cost the same as an MOS Glock. 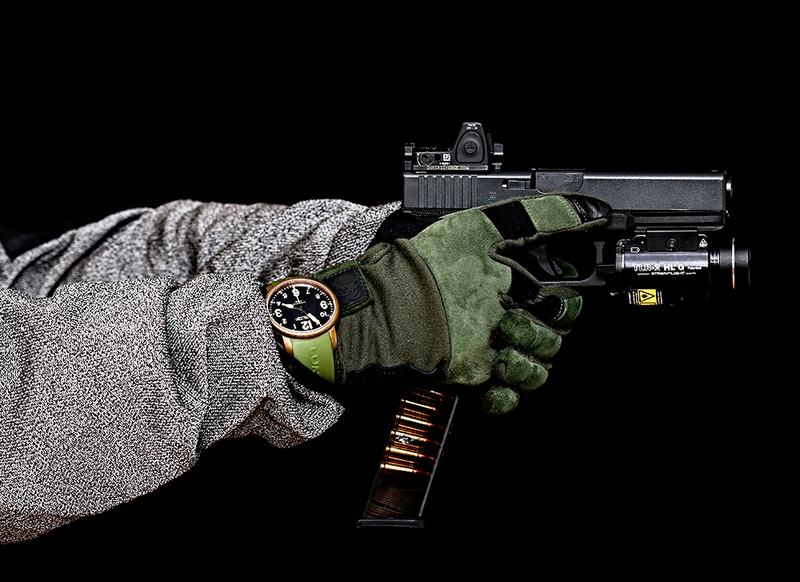 Which is an excellent choice if you are looking to get into the RMR'd Glock game, except of course if your preferred Glock is not yet made in an MOS package (like my 17L) or a 26. 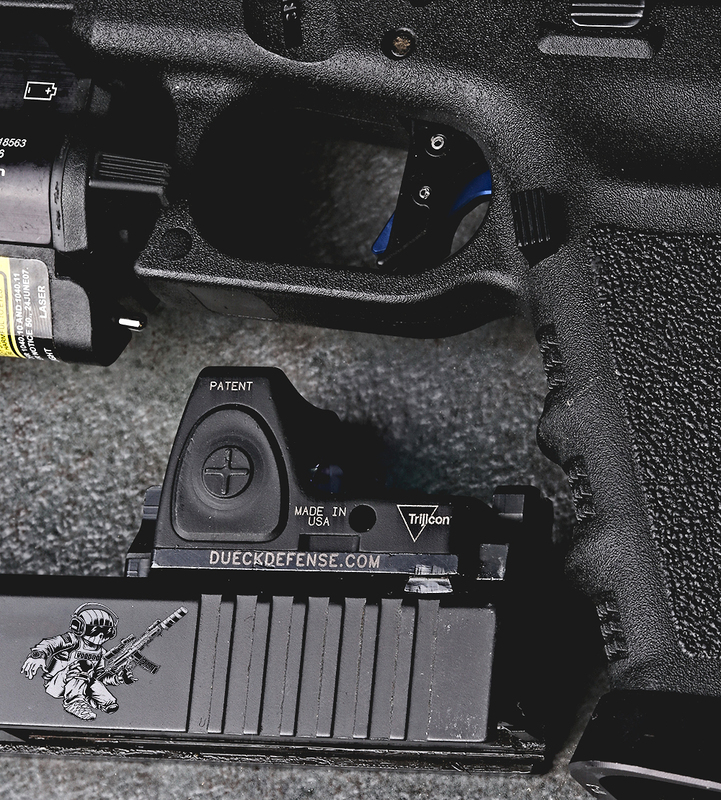 Unity Tactical has the ATOM mount, which is the only system that even remotely looks like a competitor to the RBU for RMR mounting in that once you have an ATOM cut slide or one of their slides it allows you to jump from iron sights to RMR to T1 all in one package, the kicker, of course, is that it is in the area of 3-5x more expensive the RBU. 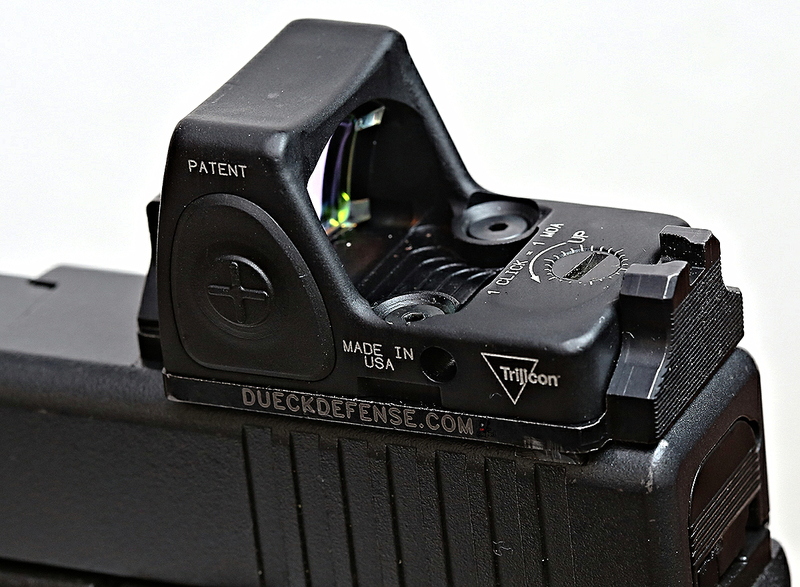 What happens when you do not want to use an RMR because you want to have an RDS on the very cheap, well you are in luck since Dueck Defense has a version of the RBU which accepts multiple RDS sights. Per Dueck Defense, this RBU accepts the Leupold 1 & 2 , Doctor Red Dot Sight , JP Enterprises J Point and Burris Fast Fire 1, 2 & 3 . It also accepts Vortex's line of micro RDS 's, like the Viper. 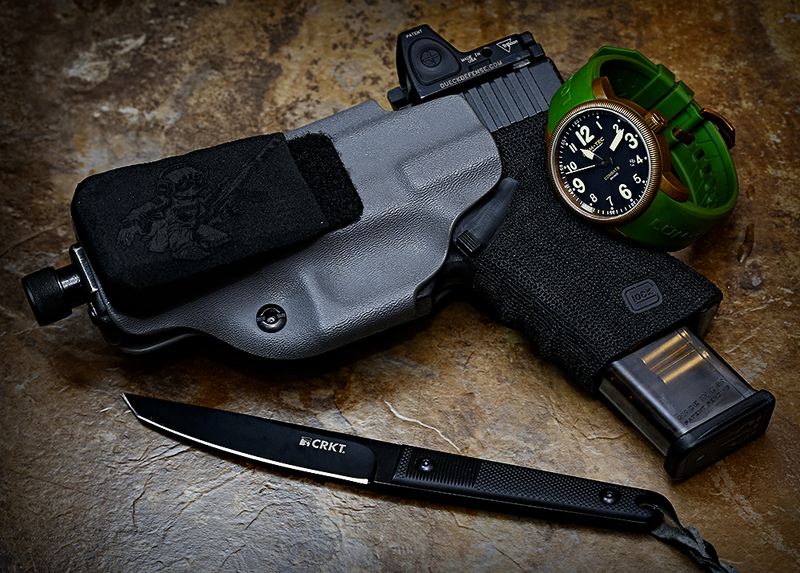 Dueck Defense also has a version of the RBU which has tritium dots built in for CCW/EDC carry. I currently have one on my carry G19 to get a good feel for the way the gun carries with this setup before I really review it with that concept as the focus. As you can see I am a big fan of the RBU and the utility it provides which is otherwise unattainable. If you are looking for to RMR your pistol, I would highly recommend considering getting an RBU instead of milling your gun or going with an aftermarket slide.